[FINE FRENCH FANFARE BINDING] - LA SAINTE BIBLEParis, Desclee et Cie, . Limited edition, number 565, text in French, thick 8vo, in a fine contemporary unsigned French leather 'fanfare' binding, boards with gilt panels with corner fleurons within outer gilt borders, panels near-fully gilt, spine with gilt-bordered raised bands and gilt in compartments, inner gilt dentelles, coloured end-papers, all edges gilt. 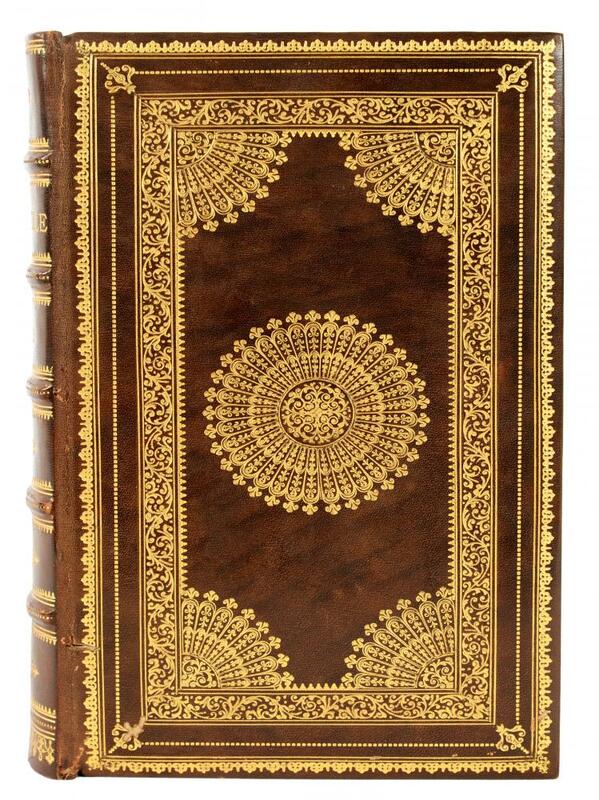 This superb binding is in near-fine condition, the gilding being very bright. Housed in a contemporary cloth slipcase decorated internally with coloured paper matching the book end-papers. The slipcase has clearly helped preserve this binding in a fine state for over 100 years.